The Micropedia project aims to create a community of diverse microscopic images contributed by our viewers. If you would like a sample scanned or would like to submit, please contact us. 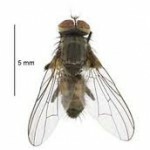 The common house fly is a stunning sight up close, revealing a veritable world of structure that is unseen by human eye. This tiling of a complete house fly (underside) shows the legs, abdomen, head, and mouth parts clearly.